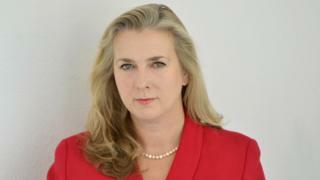 BBC journalist Caroline Wyatt has spoken of how the "brain fog began to lift" after she had pioneering treatment for multiple sclerosis (MS). Wyatt, 49, told BBC Radio 4's PM programme that she was "feeling better than I have done in a long time". She also spoke of how it had taken 25 years for doctors to diagnose her MS.
About 100,000 people in the UK are affected by MS, an incurable lifelong condition that can cause numbness, tingling in the fingers and people may struggle to walk or think clearly. It can also affect vision, cause stiffness and spasms, tremors and cognitive difficulties. Wyatt decided to go to a private hospital in Puebla, Mexico, after talking to former patients, who had undergone a course of chemotherapy and transplanting stem cells. "The chemo was to burn out the old faulty immune system so that you can have your stem cells harvested - and then brought back into the system," she said. "This helps you to grow a new immune system which I hope will not have the faults of the old one." She said some of the patients who had had the haematopoietic stem cell transplantation (HSCT) treatment had spoken of "near miraculous results". "People who had been in wheelchairs, or people who had been struggling to walk or to think or to speak clearly had come back after the treatment and, if you were a lay person, you'd say they looked cured, if you were a medic, you'd probably say they were in remission." "That inspired me to go." "For me the results have been more gradual and gentle," the former BBC religious affairs correspondent and PM presenter said. "Three weeks since coming back I am feeling better than I have done for a long time," she added. "The main thing that happened was that the brain fog began to lift." In MS the protective layer surrounding nerve fibres in the brain and spinal cord - known as myelin - becomes damaged. The immune system mistakenly attacks the myelin, causing scarring or sclerosis. The damaged myelin disrupts the nerve signals - rather like the short circuit caused by a frayed electrical cable. Wyatt, who first noticed some of the symptoms in 1990, said: "It is a very difficult disease to get diagnosed. "Because I was a journalist when I went to doctors they said, 'Ah, you've got repetitive strain injury'." She changed jobs but, following a relapse in 2001, she was given a brain scan and told she might have MS - a diagnosis that was confirmed following more invasive tests such as a spinal tap in 2015. Wyatt initially tried various drug treatments but as her condition began to deteriorate she began to investigate the stem cell treatment. "I got in touch with Sheffield who were the British arm of a trial... and they very kindly agreed to see me," she said. "They did various tests but decided in the end that medically speaking I was not one of the best candidates so they couldn't do it here." Wyatt said that although UK bodies such as the NHS and watchdog NICE describe the treatment as experimental, about 80% of people who had the treatment responded to some degree and more than 50% saw the progression of their MS halted. The charity the MS Society says the treatment could have long-term benefits for some people with MS but that larger studies are needed to better understand the impact of this aggressive treatment compared with existing therapies.